Here’s a photograph of Pharaoh taken on the 3rd December, 2005. Taken in my home in Harberton, Devon, some two years before I met Jeannie. It’s not the world’s best photograph but I start today’s post with it simply because there is a look in Pharaoh’s eyes that spells out love to me in capital letters. Always has since the day I took that photograph. Here’s an enlargement of the photo offering a closer look at Pharaoh’s expression in those eyes. Right from the very first moment that I held Pharaoh I sensed the start of a loving bond. Did I choose to love Pharaoh? Well, of course I did! Was it a conscious decision? I don’t think so! All of which is my introduction to a fascinating essay about the science of love that recently appeared on the Care2 site. Love may often feel spontaneous and sometimes even out of control. But is it, really? Research is starting to show that you can change the intensity of love you feel towards others. Similar to emotions like fear or sadness, love can be influenced simply by how you think about a situation. Is love under your control? One study looked at altering love feelings in people who were either in a romantic relationship or had recently broken up from one. Each participant started by viewing pictures of their current lover or their ex-partner to bring up their current feelings towards them. Then, researchers asked them to think about positive aspects of their partner, relationship or possible future scenarios. Their feelings towards their current or previous partners were assessed again. The second part of the study asked participants to think of negative things about their partner, such as what’s wrong with them or their relationship. Perhaps it’s not surprising that participants reported having greater love feelings after thinking positive thoughts. Whereas, they reported decreased lovingness after the negative thoughts. It was the same for everyone, whether they were in a relationship or had recently broken up. Researchers felt this shows great potential for people to take more control of their emotional world, which could in turn benefit their lives and relationships. Interestingly, thoughts also appeared to affect everyone’s overall mood and feelings about life in general. The positive thoughts improved people’s mood and disposition, whereas the negative thoughts brought everyone down. This may highlight the importance of how positive and negative thoughts in general can affect our mental health. You can likely think of times in your own life when it would be helpful to either decrease or increase your love for another person. Have you ever had an unwanted crush on someone? For instance, obsessing over a celebrity you’ll likely never meet can cause more frustration than joy in your life. Or maybe you’ve fallen for someone who’s not available, either physically or emotionally. These are times when it’s in your best interest to end your attachment to the person and move on. In addition, research has shown that thinking negatively about an ex-partner or your previous relationship helps you get over a break-up. The reverse is also true – if you think positively about an ex, it’s more difficult to heal and move on. Keep this in mind if you’re going through a break-up, or need to reduce your feelings towards someone for another reason. What annoys me about this person? Did we ever have a fight? Why were we a bad match for each other? What didn’t work in our relationship? What could go wrong if we stayed together? Reframing your thoughts is also a much healthier way to try to get over someone than taking self-destructive action to distract yourself, such as drinking too much. On the other hand, the world always needs a lot more love to go around. Increasing your love towards others is often one of the best things you can do to help yourself and everyone in your life. Unfortunately, the top reason married couples give for getting a divorce is growing apart and falling out of love. It’s true the intensity of love feelings usually fluctuates throughout a long-term relationship, but a decrease in feelings doesn’t have to mean the end. If you’re starting to question whether or not you should stay in a long-standing relationship, take a closer look at your situation before making a final decision. Do you still respect and care for your partner? Do you still have lots in common? Is it possible you’re just in a temporary slump? What are some of your partner’s best qualities? Why did you get together in the first place? Are there things you’d like to do with your partner in the future? What makes you a good match for each other? Do you enjoy spending time with your partner? Romantic partners who view each other in a positive light have been shown to actually have happier relationships. This is likely true for all relationships. Choosing more positive thoughts can go a long way towards creating greater harmony with all your loved ones. Sharing your thoughts and telling others why you love them is even better. As my dearest Jeannie will confirm, I have never been the most comfortable person in terms of verbalising my love for her, despite Jean being the dream loving partnership of my life. Jean, on the other hand, expresses her love for me many times each day. Maybe this essay offers an insight into the different ways we love? For Jean also tells the dogs individually many times each day that she loves them. I feel the same but don’t say it anything like as often. So is science showing us why the difference between Jean and me? I think so. Yet another thing that we learn from dogs. 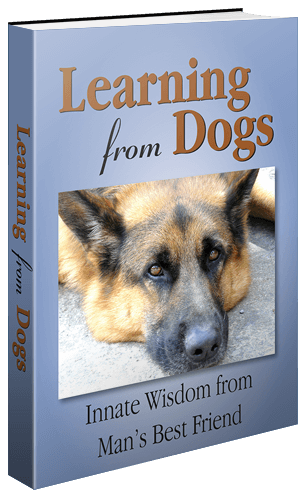 Or more specifically that I have to learn from dogs! Tell them every day how much I love them!